Today, I’m going to take a look at the 2009 science-fiction film, The Box. A small wooden box arrives on the doorstep of a married couple, who know that opening it will grant them a million dollars and kill someone they don’t know. The Box was directed and adapted by Richard Kelly, who is best known for his cult hit Donnie Darko, as well as Southland Tales and Domino. However, he has no listed directorial credits on IMDb since The Box, though a number of projects have apparently fallen through in that time. The Box is based on the 1970 short story “Button, Button” by Richard Matheson, a widely acclaimed horror and science-fiction author and screenwriter known for the oft-adapted novel “I Am Legend,” as well as 17 episodes of The Twilight Zone, including one 1986 adaptation of “Button, Button”. The cast of The Box includes Cameron Diaz (Vanilla Sky, Charlie’s Angels, Shrek, Being John Malkovich), James Marsden (Westworld, X-Men), Frank Langella (Brainscan, Masters of the Universe, Small Soldiers, The Ninth Gate, Good Night and Good Luck), James Rebhorn (The Game, Independence Day), and Gillian Jacobs (Community). The cinematographer for the film was Steven Poster, who also shot Rocky V, Next of Kin, Stuart Little 2, Daddy Day Care, Donnie Darko, and Southland Tales. The music for The Box was composed by a team made up of noted violinist Owen Pallett (Her), and Arcade Fire members Win Butler and Régine Chassagne. The two lead characters in The Box, played by James Marsden and Cameron Diaz, are based largely on Richard Kelly’s actual parents, including details of their employment and the physical disability of Diaz’s character. 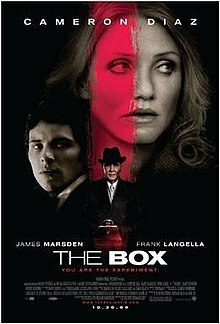 In its lifetime global theatrical release, The Box took in $33.3 million on a production budget of $30 million, meaning it barely covered the initial production costs alone – when advertising and post-production expenditures are taken into account, it was almost certainly a financial loss. Critically, the movie didn’t fare much better: it currently holds an IMDb user rating of 5.6/10, alongside Rotten Tomatoes scores of 45% from critics and 23% from audiences. Kelly treats what is essentially a Stanford University psychology experiment with inflated somberness. Diaz and Marsden look attractively worried throughout the nesting choices, options, riddles and conundrums of “The Box,” even if Diaz seems mostly to be pooching out her lips and affecting her best butter-won’t-melt Southern accent. Langella is far more impressive as the Man Who Stares at Scapegoats, which for some reason here are usually women. To begin with, I wholeheartedly agree with Hornaday that Langella is fantastic in this film, and perfectly cast for his subtly menacing, soft-spoken, and other-worldly character. That said, Hornaday is also on the mark to point out that The Box is defined by a sense of “inflated somberness,” and that “the characters move as if through Karo syrup.” The movie is not just surreal and dreamlike, but also more than a little sluggish and overburdened by incomplete tangents, nonsensical information, and space cadet ruminations. Last but not least, Hornaday singles out the most distracting element of the movie: Cameron Diaz’s completely artificial southern accent. I’m not sure who made this decision, but regardless of whether it was Diaz or Kelly, the other should have put a stop to it. Not only is it shaky and over the top, but it distracts from an otherwise dark, surreal atmosphere. The Box plays like the world’s murkiest Twilight Zone episode…Kelly has talent, but for his next movie, he might try coming down to earth and forgetting about the people who control the lightning. This is probably the biggest issue with The Box – bloat. While the premise is really interesting, this adaptation is far too elongated and inflated, both in details and length. Just as with A Sound of Thunder, which I covered a few weeks ago, this is a source material that is clearly better suited for short form adaptation. It also reminded me of season four of the original run of The Twilight Zone, which experimented with an hour-long format. With rare exception, it just didn’t work as well for the material, and season five ultimately reverted to the half-hour format. Also related to the Kelly’s screenplay adaptation, there is a bizarre and unnecessarily complicated divergence from the source in regards to the film’s ending. The original story has a tight conclusion, with the simple rhythm and finality of a punch-line. Kelly draws it out, dilutes it, and rambles and stumbles his way to an ending, somewhat obfuscating the lesson, and ruining the impact that punch-line rhythm provided in the original story. It was just a bad movie, even if it suited Kelly’s surreal stylistic tendencies more. many will hate “The Box.” What can I say? I’m not here to agree with you. This movie kept me involved and intrigued, and for that I’m grateful. I’m beginning to wonder whether, in some situations, absurdity might not be a strength. There is definitely something to be said for the the fact that the surreal absurdity of the story adds to the tone and intrigue of The Box as a whole, not unlike with Donnie Darko. However, at a certain point, grandiose ambiguity just becomes nonsense – a line that The Box definitely straddles. All of that said, The Box definitely has a unique atmosphere and aesthetic, which is the result of a meticulous attention to period details. It all fits the Matheson-based screenplay incredibly well, and adds to the phantasmagorical elements of the story. For that, and for Langella’s performance, I think this is probably worth digging up for science-fiction fans. While the movie is definitely flawed, most of its faults can probably be overlooked. For fans of the storytelling and aesthetic style of Donnie Darko, The Box is definitely worth a shot.